We have been learning all about space in school. It has been fantastic to see how much knowledge the children already had on space. We love these songs for learning the different planets and some interesting facts about them. In Aistear, we had lots of fun playing at the space station and making up stories about equipment breaking down, babies in space, and aliens. Repairs had to be down to the outside of the space station and so astronauts had to go outside. We realised there would be problems with people floating away and decided they needed to be tied to the space station before going outside. In the first week of March, we made our own planets with paper mache. Messy work and not everyone liked the feeling on their hands (or arms/face etc) but we all managed it and were amazed at how hard it got. Last week we painted our planets. A few children made Mars and Earth but mostly we made ones from our imagination. Have a look at our busy work! We did a shared art activity, making a pot of gold and a rainbow together. We practiced our colours and used instructions like "Gearr amach..., Pioc suas..." It was great fun and some children even made some lovely headbands and bracelets with the scraps. Half the class were up in Ms Kilboy's room. Here is the half that stayed with me. We learnt all about demolishing buildings over the last week. We built, demolished and sorted the materials for reuse or disposal. The children noticed that when buildings were close together it was hard to knock 1 down without effecting the next building, but we also realised that it was manageable with care. There was a lot of interesting discussion about which direction to knock down from and how to get blocks to land in a certain area. It was definitely a favourite - getting to knock buildings down! We looked at famous bridges around the world and noted the different features, realising that bridges travel over something and need to have space for something to pass underneath, not lie flat against the ground or water. We built our own bridges using Magna-Tiles, Lego and wooden blocks. We tested our bridges by checking if something could pass underneath, it could support weight on top and there was a way to get onto the bridge. With the Jaggo blocks, we built ramps for cars to travel down. We tested cars going down carpet vs wood to see which was quicker. These two tasks were quite a challenge for many and we got to see great persistence from some children! There were lots of engineering minds busy at work this week! We did a science experiment, testing different materials for waterproofing. We tested tinfoil, paper, plastic, tissue, and fabric. First, we made predictions about what we thought would and wouldn't be waterproof. We put some puppets in bowls, covered the bowl with the material and poured water over it. The one we were very surprised with was paper! We found out that it would be waterproof for a while but we decided that it would not be a great idea to make a roof out of paper! James brought in a deer skull that he found up the mountains (all cleaned and boiled first.) It was really interesing to look at and most children were excited to hold it. We also saw what would happen if we don't brush our teeth! Yuck! Thanks for bringing it in. We were delighted to play maths games again with our first class friends. This time the other half of the class went up to Ms Kilboy's room (if they wanted to.) We will play some Cluichí Gaeilge with them over the next few weeks, during Seachtain na Gaeilge. Just before midterm, we were delighted to take part in a workshop with Fiona, from ReCreate (a favourite 'shop' of mine.) She brought in lots of resources for the children to choose from and demonstrated how to put their ideas together. The children had a blast and made some fantastic creations (and a whole lot of ninjas!) We had rocket ships, handbags, Minnie Mouse ears, hats and much more! Many thanks to Fiona and ReCreate. A great big "thank you" to the Parents' Association. They invested in some fantastic Jaggo Blocks for Junior Infants. We had an absolute blast with them this week! There is something very exciting about being able to make large structures! We had a free play area with them in Aistear this week and had some very interesting pieces. Some children worked in teams and some alone. They made buildings, seats, benches, boats, houses, "a Great, Great, Great Wall of China," and some abstract creations. Have a look! We were working around the topic of "The Three Little Pigs." In maths, we were working on the number 3 - a pretty tricky number to write (especially going in the right direction - don't worry, it will come with practice.) We sequenced the story, in history and made some fantastic maps in geography. In science, we compared the different materials used by the three pigs and tested to see what was strongest. There was lots of fun role-playing the story and there were some fantastic, alternative endings made. We did some fun "blow painting" in art, helping the wolf blow down the straw house and also making funny haired people. In Junk Art, we made new homes for the pigs, which secret doors, escape tunnels, fake chimneys and traps! We had great fun playing maths games with Ms Kilboy's 1st class children, as part of Maths Week. Half of our class went upstairs to Ms Kilboy's and half of her children came down to us. We are going to be doing it again soon, with the other half of the class going upstairs. If you would like to see Ms Kilboy's photos from her room please check out her blog and scroll down a couple of posts. In PE we have been working on the gymnastics strand. We've been improving our balance and strength on the benches and practicing log rolls and pencil rolls on the mats. We enjoy doing obstacle courses and stations usually. We did yoga in PE also and, it turns out, we have our very own yoga expert in class, who taught us all some of his moves. Finally, we also had a skipping workshop, which was great fun and pretty challenging too. We had such lovely visitors in our classroom and so many excited children, thrilled to see their grandparents come in. There were many who weren't able to make it but we talked about all of them and heard some great stories. The grandparents who did make it were very kind and involved all of the children around them in their games. And apologies to Tom's granddad...Tom was too busy playing to pause for a photo, although I do spy them in the background of a few pictures. We drew pictures the day after, showing us playing with our visitors. Welcome back after the Christmas holidays. I hope you all had a wonderful break. We are back to work in class with a lot of focus on blending and written work. We started out writing the number 1 just before the holidays and are writing 2 now. Next week, we are moving on to 3 and beginning writing letters, starting with i. We have finished all of the sounds we focus on in Junior Infants. (We look at all the alphabet sounds and "ch" and "sh." More letter combinations will follow next year.) Now, we have moved on and are using cvc (consonant/vowel/consonant) cubes to help us spell/sound words out. We are stretching the word out when we say it to help us. We are also focussing on word families - we started off with words that rhyme with 'at.' We drew pictures of things in the at family and some people even wrote words. We love the Jack Hartmann video on YouTube. It is great fun trying to read the words before he says them. We are having a fantastic time learning all about the Arctic at the moment. We will be focussing on the Antarctic towards the end of January. Thank you for donations/lend of sheets, Styrofoam, books and more. It has been such a help. We have been learning all about polar bears, Arctic foxes, hares, seals, beluga whales and Inuit people. Our small world area has had lots of use over the last few weeks. The children played with pretend snow, Arctic animals, ice floes and icebergs, as well as some odd bits. Polar bears went hunting for seals on ice floes. Bear caves were created and snow storms took place. Unsurprisingly, a lot of sweeping up snow happened also! Our other two areas so far have been sensory - making things we would find in the Arctic with playdough and the Quiet Area - reading and chatting about the different Arctic/Antarctic books. Our next Aistear theme will be the Post Office. If you have anything that could be used for this, such as a postoffice counter, old envelopes, unwanted stamps, wrapping paper etc, that would be fantastic. ​We have been looking at the different roles of people in the Health Centre during the month of November. It has been lots of fun. Here we are in action, visiting the doctor. We played being doctors, nurses, receptionists and patients. Lots of health checks were done, injections took place (a few sneaky ones for scared patients) and prescriptions were written. We visited the optician's and had our eye sight tested. We had two charts, one for those who knew their letters and one with symbols for those who didn't, just like in the real optician's. Some people discovered that they needed glasses and they tried on lots of different frames to see what they would like. We were busy constructing health centres and ambulances (which had to be able to fit one of our small world people inside.) We had great fun making body outlines using the blocks. Some of them morphed into car parks and ambulance bays. The art area was very popular, especially the junk art task. Look at all the fantastic creations. We made x-ray pictures using chalk and cotton buds. Some of the children broke the cotton buds up to show their broken bones. We did great process focused painting using syringes and droppers. It was interesting to see what happened when we squirted the syringe from up high compared to down low and what a difference the force we used on it made. We made glasses out of pipe cleaners and circles...wow, that was a challenge! We also had a science area where we explored and sorted by "hard and soft." Some items were a little tricky. We found that the best way was to try to bend them or squeeze them to see if it was hard or not. We also found out that harder items made a bigger noise as they were being dropped. We used catalogues from Lidl and Dunnes to find healthy and treat foods and we cut them out and sorted them also. We have been really lucky to have Adam in to do GAA with us on Mondays, which has been fantastic. Adam brought in the Sam McGuire cup after the Dublin win! We had Joey in from Leinster Rugby doing some games on with us, which will be happening every second Tuesday for the next few weeks. The injections took place on Wednesday and everyone was very brave. There were some sore arms and tired bodies. 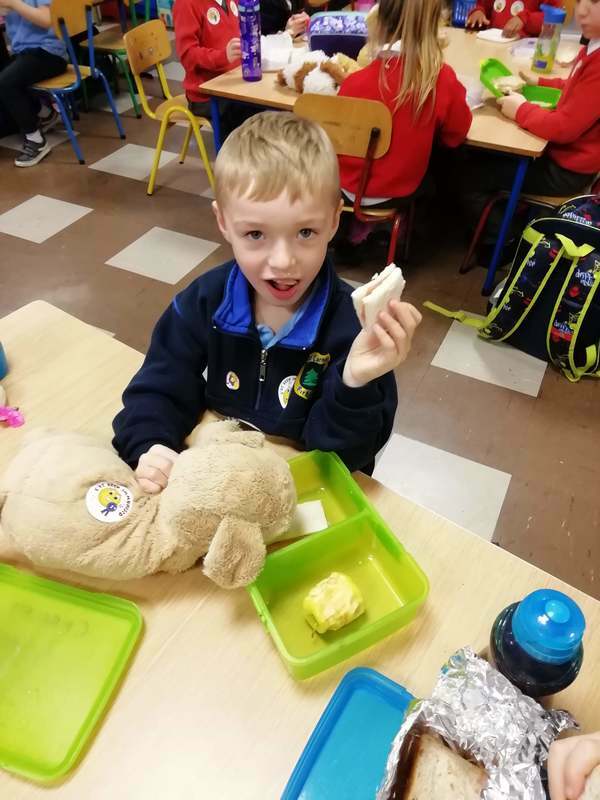 Our teddies were a great comfort, even if some were a little greedy eating up our lunches!! Our Parent Teacher Meetings are going to be held on Tuesday 27th and Thursday 29th of November. I am unable to fit all of the meetings into the days (Junior Infant meetings are 15 minutes long) so they will be taking place on the Monday and Wednesday also. I am using a site called SignUp.com for organising the meetings. This will allow you to pick your own time from a list, which hopefully will suit you all. 2) Review the options listed and choose the spot you like. Note: SignUp.com does not share your email address with anyone. If you prefer not to use your email address, please contact me and I can sign you up in the classroom. 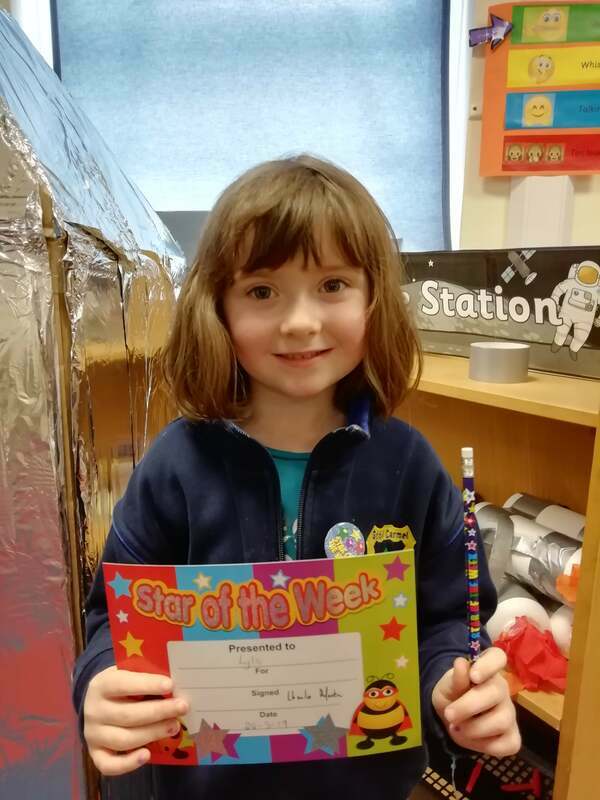 It is hard to believe we have finished our first half term in Junior Infants. There is a big difference between now and the beginning of September - lots of new friendships, new rules to follow and a big change in the structure of the day from playschool to now. Well done to all of the children for settling in so well and getting used to a new environment so quickly. We have been having lots of Halloween fun for the last week (and maybe a bit longer too.) Here we are making 2 colour pattern paper chains. We compared these to see which ones were longest and shortest. We have also been busy with Aistear and learning lots about the home and families. There is also a lot of discussion taking place - we "plan, do and review." Before every session begins, each group has a huddle and plans (without teacher intervention) what they will do and what each persons' role is. This has been a worthwhile technique for the children to use and has spilled over into yard time as some children have a hudddle at the start! During an Aistear session, problems arise - in certain areas more than others, where a lot of interaction is taking place. I try to allow the children to sort out their own issues, as much as possible - "How will you solve this problem?' "What could you do to fix it?" "If you were 'X,' what would you think/feel?" From week 1 doing Aistear to our final week this month, it has been fascinating to see the development and changes and the growing independence, and I am sure it will only improve. After Aistear, we tidy up as a team and if we finish tidying quickly in our area, then we move to help others. Some children are fantastic at this and we see a lot of skills that they learnt at home being used in the classroom - tidying, sweeping, folding, putting this away in their right place, asking for help when needed, and much more. Here comes a lot of Aistear photos - I find it hard to pick just a few! We have really enjoyed looking out for signs of autumn. The classroom has quite a collection of conkers, pinecones and leaves, among other things. We did a science experiment during the week using pinecones. Firstly, we explored them, just looking and feeling first and then we pulled them apart to see what held them together and how they felt inside. Then we began an experiment to see what would happen to pinecones if we put them in water. We found out a few really interesting things. The first interesting point was that when we looked through the water - the pinecones looked much bigger. We also noted that pinecones float on water, which we thought was helpful for spreading the pinecones to faraway places. In our experiment we had 3 containers, 1 with no water, 1 with cold water and 1 with hot water. We made predictions about what we thought would happen when they went into water. It was really interesting to watch. We noticed that the pinecones in cold water began to close up but very slowly. The pinecones in the empty jar stayed the same and the pinecones in hot water....well, I wonder who remembers at home what happened to them? Here are our fine motor skills activities in action. These might give some ideas for activities you can do at home. And remember, household jobs can be excellent for strengthening these muscles. Win win! We will be starting the theme of the Health Centre after the break. If you have any equipment that we could borrow or that you would like to donate, that would be fantastic. We are going to focus on the Doctor's Office and the Optician. In particular, if you have any old glasses that we could pop the lenses out of or old sunglasses, it would be great. Have a fantastic mid-term break! See you all on Monday week! Have What a scary day!!! We went on a walk down the avenue today and found so many different Halloween decorations. There was a lot of inspiration there for little imaginations and it turns out that some of you are apparently living in haunted houses, have zombies living with you and even a graveyard in your back garden! We practiced our Gaeilge as we went: "Is mise an cailleach/ Seo an púca/Seo an damhán alla." We pretended to be zombies also and made different Halloween noises as we went. Have a look at the fun we had and the great expressions we made! 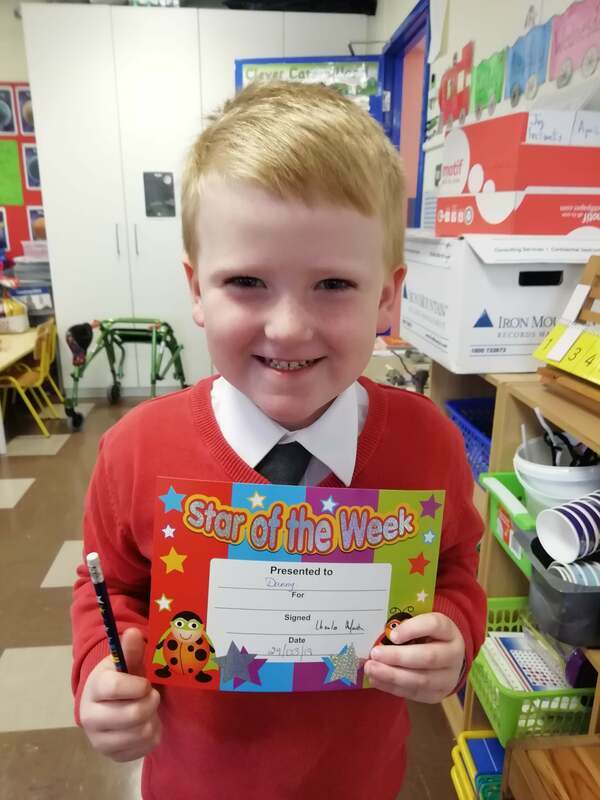 Well done to Danny, our star of the week and Lyla, last week's star!